The uncertainty over the Brexit process made GBP weaker against the strong USD. 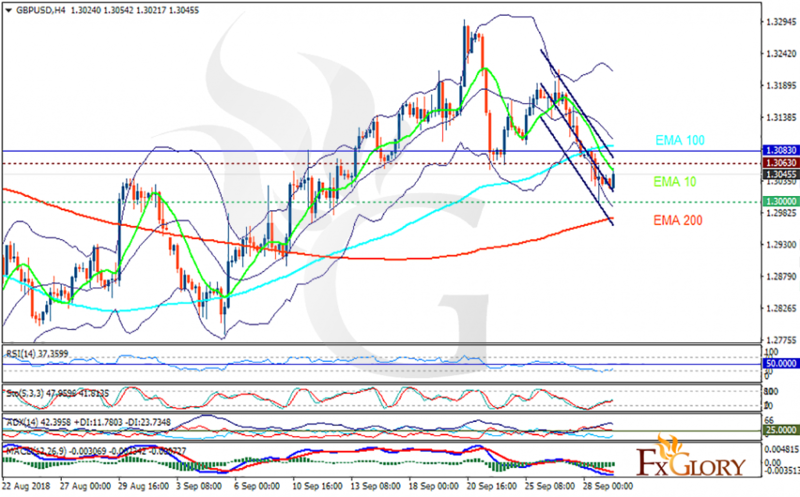 The support rests at 1.30000 with resistance at 1.30630 which both lines are below the weekly pivot point at 1.30830. The EMA of 10 is moving with bearish bias in the descendant channel and it is above the EMA of 200 and below the EMA of 100. The RSI is rising towards the 50 level, the Stochastic is showing upward momentum and the MACD line is below the signal line in the negative territory. The ADX is showing sell signal. The resistance level breakout can push the price up towards the upper Bollinger band at 1.32, otherwise it continues its downward trend towards 1.2990.